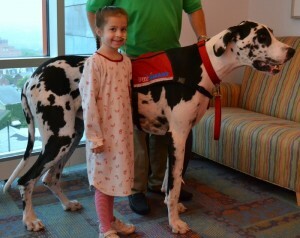 After a nine year old family member developed cancer 3 years ago, he wanted our huge Great Dane, Bentley, to visit him in the hospital. Because of hospital rules, Bentley had to first become a therapy dog to be able to visit children in the hospital. Bentley not only became a therapy dog, he became the World’s Largest Therapy Dog and also has the Guinness World Record for longest tail ever on a dog. He missed being the world’s tallest dog and the longest dog by less than 1/2 inch each. Sponsored by PetSmart and Organix dog food, Bentley has been going to children’s hospitals all over the United States raising money and awareness for canine and pediatric cancer research. In 2012, Bentley raised $25,000 for canine cancer research and $25,000 for pediatric cancer research. He now has a children’s book coming out on Kickstarter.com and a portion of the proceeds from the book sales are used to fund free books being given to the hospitals that Bentley visits. This entry was posted on Monday, September 23rd, 2013 at 7:37 pm	and is filed under Dogs, Human-Animal Bond, Research. You can follow any responses to this entry through the RSS 2.0 feed. You can leave a response, or trackback from your own site.